Sony STR-DA3600ES review | What Hi-Fi? It's not often that we describe Sony's home cinema amps as being ‘off the pace'. But, that's the phrase we used last month during the review of the £500 STR-DN1010. Is the 'DA3600ES up to speed in this month's showdown? As with all of Sony's home cinema amps, great attention is paid to design and build quality. Inside you'll find new high-grade components, all assembled in a mission to improve sound quality. The 'DA3600ES also features a more advanced version of Sony's Digital Cinema Acoustic Calibration. Besides being one of the quickest auto set-up systems we've seen, it now incorporates Automatic Phase Matching (APM) technology, which can tell which of your surround speakers are in and out of phase and alter settings accordingly. This is useful if your speaker package is a mix of models and manufacturers. Another funky feature of the ‘DA3600ES is the fact that it acts as a hub for other ethernet-equipped devices. Simply connect your router and up to three additional products to the ethernet sockets on the rear of the amp and they'll stay connected to the web. It works well, although our review sample fell over a couple of times while trying to connect to our network. 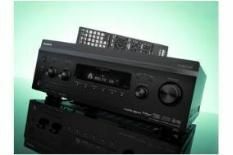 The Sony is DLNA certified and also offers access to the SHOUTcast internet radio service – but we found using it a pain and no match for Onkyo's or Yamaha's equivalents. The menus are deeply unintuitive, which is a shame because the amp's standard PS3-style XrossMediaBar interface is a peach. Despite being fed the dramatic soundtrack of Green Zone, the Sony never really gets you on the edge of your seat. There's a surprising lack of drama as Matt Damon and his men come under fire from the sniper in the tower block. Yes, low frequencies are relatively muscular, but this amp appears to grip soundtracks almost to the point of strangulation. It seems unable to breathe, which is a problem when it comes to communicating subtler soundtracks that demand greater finesse and clarity. The 'DA3600ES proves inconsistent when asked to upscale incoming video. There are some moments of excellence – clarity, sharpness and contrast levels and colours are nicely judged – but there are also moments where edges show flickering and judder. We had high hopes for the STR-DA3600ES but in reality this amp just can't cut it against the rest of the pack.